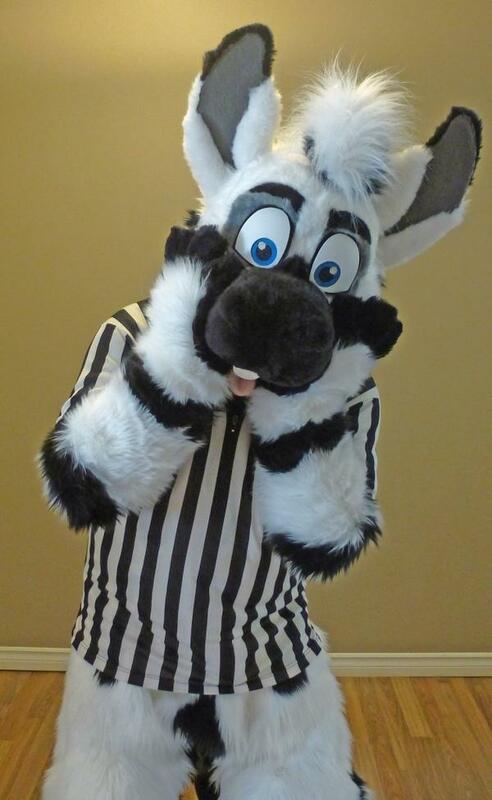 Chat with Strypes, Edmonton Oil Kings mascot performer and fursuit referee. 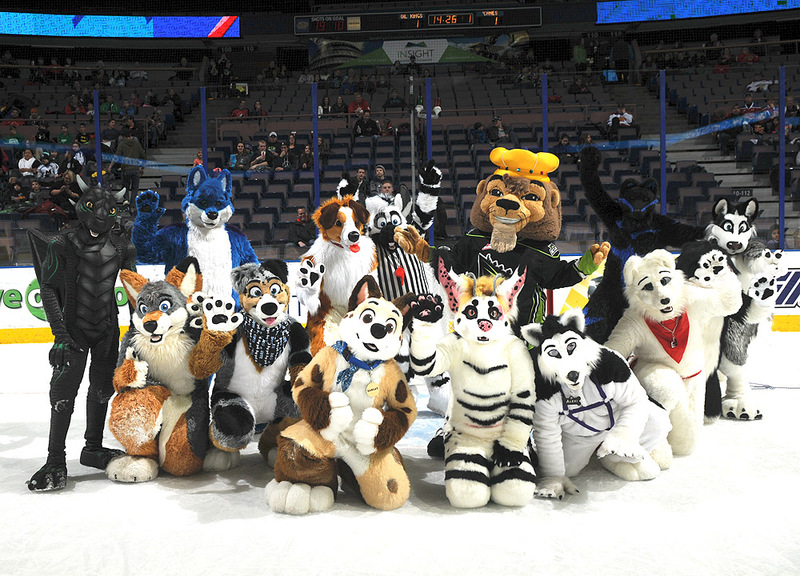 On January 2, 2015, the Edmonton Oil Kings hosted a fursuit race at their hockey game. The “Frantic Furry 500″ entertained the crowd during intermissions. It was organized by Strypes, (AKA bcbreakaway). It was incredibly cool of Strypes to answer my questions about the event and his furry activities. I was surprised to find out that he seems to have discovered this fandom only two years ago – and he’s a professional mascot who already had the spirit inside. Give him a high-paw for being an amazing example of why Furries rock! (Patch): How did you get into furry? (Strypes:) Actually, this all started with me building a fairly elaborate werewolf costume for Halloween back in 2012. I started a Twitter account on November 1 of that year mainly to show off my creation. Almost immediately, I was contacted by “werewolf enthusiasts”, many of which turned out to be furry. (Up until then, I really had little concept or idea what a furry was, so this was an eye opener.) Fortunately, my early interactions with folks on Twitter were largely positive and it led me to create my next costume (a minotaur). I went to my first con (Fur-Eh! here in Edmonton) in May of 2013, but it really wasn’t until MWFF 2014 that things really took hold. In the second half of 2014, I got Strypes from My Fur Creations and here we are today! What do you like about furry? I really like the creativity of so many individuals in furry. I’ve also found it very welcoming considering my first two suits were not meant to be “cute” fursuits. Yet, despite that (or maybe because of it), I’ve always felt included. I marvel at the artwork and the general enthusiasm, too! The best part is that many of the friendships I’ve made since November 2012 are ones that I see as strong and long lasting. I’ve also met many incredible people from many different places that I don’t think I would have had an opportunity to do so any other way. Tell me about organizing the fursuit race at the Oil Kings hockey game. Did you have any behind the scenes experience to share? For most (if not all) of the participants, it was the first time they’ve been in the backstage area of the arena, so it was kind of a neat experience for them. How was the event idea proposed with the team? I brought up the idea with my liason with the team when he mentioned wanting to do a “mascot games”, but that due to potential sponsorship conflicts, they couldn’t. I asked him if he’d be interested in doing a mascot game with non-branded mascots and showed him a photo of my character “Strypes” as an example. He loved the idea so he pitched it to his management team and it grew from there. Do you regularly perform with the team or did they just approach you? I work with the Oil Kings as one of the original performers for Louie The Lion (the team mascot). Were there any interesting reactions from the public? How was the response? When we first walked onto the ice at the beginning of the intermission, I could actually hear the crowd get excited. That was kind of neat because usually, the crowd usually is pretty quiet during the intermission events. While I couldn’t hear much of the crowd once the race started, I heard a good cheer again when Louie won the race. I was glad the fans enjoyed it. We also sent half of the fursuiters up to a photo op area with Louie the Lion for the balance of the first and the entire 2nd intermission. Lots of photos were taken! As for online, moments after the race was done, we noticed that some of the general public had already started tweeting some photos of the race. One commented that it seemed that the Oil Kings were having a furry convention disguised as a “race”. It was pretty funny and not mean-spirited. As well, those tweets and the official photo posted by the team on their website (oilkings.ca) has been fav’d and retweeted hundreds of times now! Do you expect to do it again? We do! It won’t be until next hockey season, but the team is looking at perhaps promoting this in advance, too! This was a nice little moment in the spotlight. Will it have any longer effects for your local Furry scene… and what’s that like? I don’t know about whether there will be longer term effects resulting from this. I certainly hope for positive ones. Some of the participants had never met each other in person before (I can say the same), so it was definitely a good way to meet some more “locals”. Ultimately, I think we were all a part of something special because it was the first time anything like this had been done here and that’s something we can take with us.